Antivirus protects your PC(s) specifically against viruses (which is a type of malware capable of self-replication) that usually spread themselves through the Internet, via malicious downloads, infected e-mail attachments and files or documents. Whereas Internet Security packages protect your PC(s) against a range of malware (not just viruses) out there like worms, adware, trojans, ransomware, etc. In other words, antivirus software offers PC(s) only the basic protection. Something you can do when you don't have any other form of protection against security threats. 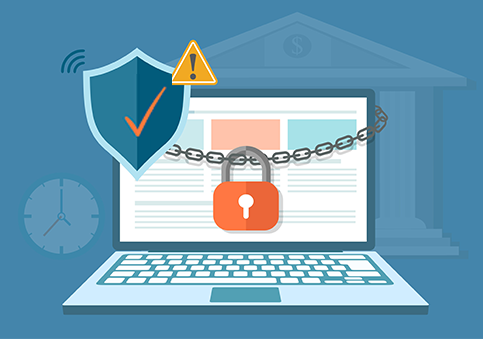 On the other hand, the internet security suite is usually the whole package, which safeguards your PC(s) against external threats (which arise from the internet) as well as internal threats (which also arise from the internet but are capable of spreading from one computer to another). Users can defend their PC(s) using antivirus. But in case an advanced malware (which antivirus cannot handle) seep through, they won't be able to take action against them. For example, malware removal. For this, users need advanced antivirus (paid ones) or internet security suites. Hackers are exploiting zero-day malware (malware which hasn't been observed before and therefore cannot be predicted) like never before, and unfortunately, antivirus software cannot handle zero-day malware. You need internet security suites which are basically online services that keep themselves updated in real-time and therefore can handle zero-day malware successfully. Antivirus Is A Vital Part Of Every Internet Security Suite: Every internet security suite will contain an antivirus package. So that if everything else fails, the antivirus software will at least be able to minimize the damage which may be caused to your PC by the security attack. Antivirus Suits Home Users Well. Internet Security Packages Suit Business Users Well (and also the Security-Conscious Home Users): Home users are comparatively at lower risk when compared to enterprise networks. Therefore, antivirus (although it offers only the basic form of protection) alone may suffice for home users. But business users (enterprise networks) have no choice but to use internet security suites, to stay away from modern-day malware. Antivirus (basic edition) is Usually Free, Internet Security Suites Cost You: These days, basic antivirus is available for free. In some cases (like with our Comodo Antivirus) internet security packages are, in fact, the paid version of the free antivirus. Since internet security suites usually offer features like 24/7 available support, malware removal service, Wifi Security etc., it's hard to come across free versions of them.